Still wearing my Ironman wristband, I woke at 1:30 am on Thanksgiving day. I could not get back to sleep. Unlike Ironman, I had been prepping for the YMCA Thanksgiving reverse sprint triathlon. It's a one hour race. A 2 mile run, 12.5 mile bike and a 400 meter swim. The swim being last is my mortal enemy. If you think I am slow in the water you are right. At least I didn't drown. I had breakfast and loaded up on anti-histamines and throat lozenges. I had been sniffling and aching since Ironman. It sort of made me feel like an oxymoron. Or just a moron ... to be sick after such a "look how tough I am" event. I arrived early enough to get a decent spot in transition. I loaded up my spot with my gear and headed back to the car for a nap. I actually did go to sleep for a bit. Around 6:00am I emerged from the car and parked myself at the end of the pool area and waited for the race to start. I had a brief warmup jog with Sharky. My legs felt fine, which was a surprise. What did not feel fine was my breathing. My chest felt like it would explode. Everything was shallow. I knew I was screwed before the race started. I tried to loosen it up and relax. I tried to think positive thoughts. BANG! There's the gun. I looked at my pace about a quarter mile in ... I was on a 5:40/mile pace. Okay. This works. That's when the wheels fell off. Mile one was a 6:50. Mile 2 a 7 something. I was already out of the race. (I had been running 12 minutes for 2 miles in training). My bike was surprisingly good - time-wise - considering how inconsistent it was. I felt slow and cumbersome with only bursts of the speed I can generally muster. I had been biking 12 miles in about 30:25 in training. I guess I was close to that because the bike time includes both transitions and I went 33:44. I hit the water with all the power of a feather. I literally SANK TO THE BOTTOM and stayed there for a moment. I don't think I am the only dude that is negatively bouyant but I guess I need people to understand my lack of bouyancy. Here's an example: When I jumped off the pier at Tempe Town Lake for Ironman I grazed the bottom of the lake with my left toe. I was wearing my wetsuit AND trying not to touch the bottom of the lake. It is 12 feet deep. Yeah - it's that imbalanced. I love 50 meter pools though. I can get in the little bit of swim groove that I have and stretch out a bit. 11:06 for 400 meters. I was gassed. Funny enough - I didn't stop the entire time - but my turnover on my swim stroke was sluglike at best. Do not expect OR EVEN ATTEMPT a top-notch performance during illness. If you race while you are semi-sick - you will likely get SUPER SICK. I spent the following day at the doctor's office and in the bed (Sinus and gland infections). I am just now (4 days later) starting to recover. Life is a journey and a learning experience. I am just dumb enough to have constant turnover for new subject matter. May 5, 2012 did more damage to me than it should have ... mentally. It really is silly. This whole pursuit of the perfect way to DESTROY one's body and actually get a kick out of it. I see more clearly what this whole journey is about. It's not just about getting a fitness routine. It's not about improving your overall health. I truly believe it is about finding the dark recesses of the brain and deciding once and for all what do to do minimize those dark areas. Wait! What? Don't try and wax philosophical here Bryonman. I'm not. I am also not trying to make long-course triathlon into some "solve all problems" medicinal journey to the top of the mount. What I am trying to say is that I believe that I had a defeatist attitude prior to getting into multisport. Everyone that does a race or a training day that goes to the edge of their abilities KNOWS that there are moments of true soul searching. My favorites in the past three months have been those eight or nine hour days on the bike. Being all alone with no one watching and STILL keeping pace and time is a true victory of the human spirit. When that darkness creeps in on those days I have now gotten to the point where I grab on to it and explore. I want to understand why I have negativity. More importantly I want to be able to empathize with other people that I know that dwell in the negative far too often. Because there is a VERY SHORT LIST of people on the planet that we get to say TRULY care about us. In the past, I firmly believe that I was very selfish in that the caring was not really a two-way street. "My name is Bryan and I am a self-centered egotist." My short list of people cared about me deeply and I don't think I cared enough about them in return. I know most of you that actually read this drivel would vote for that statement and call it gospel. That previous Bryan is fading ... even amidst all this self-centered endurance obsession. Here are some things that happened on Sunday that noted this change. 1) During the swim ... I was starting to get frustrated and felt I wasn't covering enough water to make the cut-off. Then I started thinking about my dad's friend Richard. Richard was an athlete and a very nice guy too boot. He and dad knew one another for 58 years. Richard would have loved triathlon. He never got a chance to compete. He passed away from cancer last month. This crushed my dad - which in turn crushed me. "Swim this out for someone else man. This is bigger than you. Get it done. Stop whining." 2) During the bike ... my favorite part (I know - surprise surprise) ... I am typically balls-out like Jo Jo the circus boy. Literally two minutes before we hopped into the cess pool for the swim Barry Tait walks up to me and says "You know what you need to do today? Back off that bike so that you have something left for the run." I admit now that I had a dark moment right then. Bullcrap - I thought I am going to hammer this bike course. Then I embraced the darkness. Barry does not deserve this disrespect. So almost in the same moment I went from "don't you tell me what to do" to "Hey wait - you aren't even supposed to be here today so why not try something new?" So I did as Barry suggested. I was originally going to ride a 5:15 which is well within my ability. I ended up riding a 5:40. Barry Tait is about 90% of the reason that I managed to push 190 lbs. to a sub 12 Ironman. I won't forget that. 3) Fighting against my urge to hammer the bike the entire 112 miles I watched as many of my fellow 'competitors' blatantly broke the drafting rules on the bike. I admit that I wanted to get in on the energy savings. I entered another dark zone and almost joined a big group. I refrained. It made it tough to pass these huge groups of squids but it was also gratifying. Let me get this straight fellows - you are all drafting and I can still manage a pass while sitting up and eating? I will chalk that one up to hard work on the bike this year. 4) On the run I only remember one dark moment. The rest of the time I felt fresh enough to chest bump gorillas (irony), moonwalk through aid stations and yell at teammates and friends. The dark moment was about mile 14. My stomach started churning - similar to the "big release" churn at St. George. I wanted to stop and walk. One cramp doubled me over but I was STILL passing people. I passed this older lady while bent over in pain. She asked me if I was okay. I grumbled something and kept running. About a minute later the pain stopped and I slowed down just enough to tell her thank you for asking if I was okay. Then I started thinking about Carrie. I started thinking about how much she would love this if her knees and feet would allow her to compete. I got a surge of energy from that did not stop until Tuesday night. Sidenote: Being a sucky swimmer has advantages. I passed approximately 1,558 after I emerged from the water. If I'd been passed by that many people after the swim it would have been mentally exhausting. Ironman Arizona 2012. "Surprise - you get to do 12 hours of cardio today." 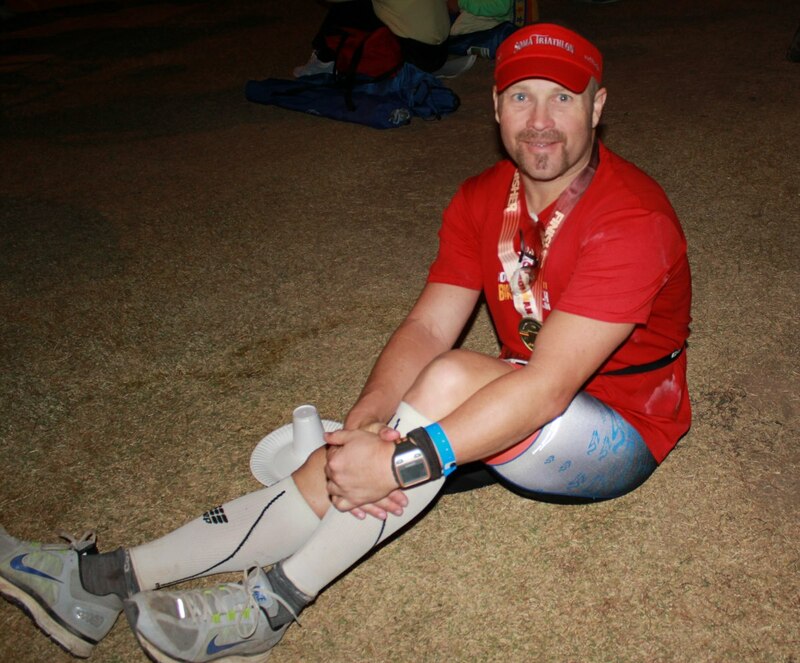 So how did I go from not doing Ironman Arizona to finishing Ironman Arizona in 11:57? Well it's a short story really. We got to packet pick up in Tempe. I kind of looked at Carrie and I was like - well we have already paid the money and we were planning to work out this weekend anyway. She and I were just going to start together and get as far as we could together. I was looking forward to it. Then, she woke up at about 2am on Saturday and she was sick as a dog. Sneezing, hacking and fever. "Just go check your bike in and do it," she said. I was beside myself. "Really?" For this I will forever be grateful. Wife - you are a good egg. I love you. With no game plan in place and the longest swim I had done in two months being 3000 meters about a month ago ... I was in my wetsuit standing on the shore of Tempe Town Lake with my friend Scott [sharky] who swam a 1:19 compared to my 1:47. I had kept my post-SOMA fitness by walking and hiking with Carrie and Baron. I had also been doing some speed work - training down (or up) for the sprint I have on Thanksgiving Day. 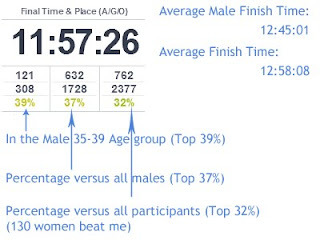 I knew I could handle the bike and run - if I could swim under a 2:20 to avoid the 2.4 mile cut-off. This was the biggest mass start on the swim that I've had. It's weird. I was never alone during the entire swim. Constantly getting groped or kicked. The course curves a bit so I had some of my typical sighting issues ... but not bad. I thought for a bit that I might not make the 2:20 cutoff - so I swam with a little more efficiency. Just like always I had moments of decent swimming interrupted by water slapping flailing. Out of the water at 1:47. I had planned a 1:45. Not too bad on the planning. I wish I could swim faster -- even a 1:30 would be great. Someday. At least I got through it. Finishing is the accomplishment. The time is secondary. My transitions were much better than at St. George. Why? Because I was racing rather than chatting. I still had fun though. I was cracking wise with the volunteers and they humored me with their cordial chuckles. It is a little weird at Ironman races with the bag system I prefer having my stuff laid out where I can easily just pick it out and take off. It is nice to have your bike fetched from the rack for you. T-1 - 8 minutes. The first lap of three on the bike was weird. On the climb up the Beeline to Shea - my quads were still jacked from the swim. I was horizontal for too long. Then the first downhill was awesome. I hit and stayed at 30 mph for a long while. Without this first lap - my bike time would have been much slower than it was. The wind picked up a bit on Laps 2 and 3. It's funny how even the slightest wind can have a huge effect on the bike. I wasn't the only participant that noticed the wind. It was just enough to be annoying. I finally closed the 30 minute gap Scott put on me on Lap 2 of the bike. He was having some intestinal issues. I stayed with him for a minute or two - but did not want to have any cramping to set in - so I bolted off. I played chase with a Pro triathlete for a while until I decided that I was being stupid - so I backed off and resettled in my groove. Off the bike in 5:40. For the record - I did go "potty" three times and had a 3 minute ordeal (yes I timed it) with some mud stuck in my cycling cleat that temporarily prevented me from being able to clip into my pedals. T-2 - Bike to run with sunscreen application 3 minutes. I knew I could really save some time on this transition. The run felt pretty much the same the entire time. I just ran within myself and avoided straining my calves and quads. I did a good job on nutrition all day (after I found my hidden salt tablets.) I did not eat as much on the bike as I did at St George and that helped me on the run. Chicken broth. Wow. I love that stuff on marathon courses. It did not hit the shelves until I was on mile 20 ... so I started gulping as much as I could. I met Sean from California at about mile 23. He and I stuck together until mile 25. He fell back. I was afraid to fall back with him. I knew we could get in under 12 hours if we kept pushing. I was consistently around a 9:30 pace for the entire run. Again - it is not about time. It is about racing smart ... accomplishing the task ... and arriving at the finish line healthy and in one piece. 26.4 mile run - 4:13 ish. The St. George gorilla is off my back. It is now official. I am Bryonman. In summary - it was a good day. Thanks to my family. Specifically to mom and dad for giving me this cardio engine. Thanks to EVERYONE on Team Triple Sports and WannaTri Triathlon Coaching. So we spent 6 billion dollars to drive a wedge further between our United States. I am quite certain that 6 billion could have been used in better ways. 1) I wish that we could return to a cohesive union of individudalized states. 2) I wish people would think for themselves rather than have television, the pastor or the gasbag neighbor tell them what they think. 3) I wish people respected the office of the President - no matter what. I have been guilty of this myself. If there is no respect for the position it will never attract the true leaders we need. 4) I wish we, as a "civilized" society could return to TRULY caring about people. Two-faced niceities are WORSE than honesty. 5) I wish we had the LOGIC to team up to fight real issues ... cancer, environment and energy are issues worth tackling. Let me sum it up. No one is going to take your guns. It's a woman's body - women have brains so they can do what they want. We live in a country where you can say anything you want. Let's drink tea because throwing it in the ocean only ruins two good things. 6) I wish the two party system would go away. Math tells me that it is the cause of the country's division. 7) I wish the grumbling would stop. I know I am contributing to the negativity in this list, but I have a point. Wait for it. "Hey "toolbox" - this is a triathlon and fitness blog. I don't need to read your soapbox rants." HA! Gotcha. You read it anyway. All 5 of you. Here is the deal. We, as a unified front, can do ANYTHING. 1) Let's be more positive. 2) Let's be less sarcastic. I'm as snarky as the next guy - but it harms things. 3) Let's be less materialistic. 4) Let's only engage in healthy competition. 5) Let's find any hint of momentum and ride it out. 6) Let's engage in works that support the whole. 7) Let's bury 'we versus them'. I applaud each American that can stand behind a cause. Here's the kicker ... let's use that energy toward the CORRECT causes. I don't believe I see many movements flying around in our era that are the correct causes. Moreover I believe some of the people and organizations that ARE trying to do the right thing get trampled on because they are in direct conflict with a corrupt special intrest. I am talking about organizations like Susan G. Komen - or Livestrong. These are organizations that have been dragged through the mud over what SHOULD be considered INDIVIDUAL faults or lapses in judgement. People make mistakes. We, as a people, should not penalize an entire movement due to the acts of an individual. I think we'd be surprised if we unified. Okay. Two posts in one day. I can't help it. I have ranted about this before. I am ranting again. This is a great summary of my thoughts on basic GYM ettiqutte for your review ... before I launch into this story. I go to the gym at lunch during most work days. 1) It keeps me from spending money during the workday by going out to lunch with coworkers. 2) I like it ... for the most part. Today I hopped on the spin bike to blast out an all-out 30 minute rumble. The second part of the plan was an all-out 400m swim. I suppose the circumstances caused me to push even harder than I would have otherwise. So there are a set of guys that generally irk me while I am in the gym trying to better myself and somehow staying out of everyone's business. Let me label them - and this is based on many many hours of listening to their ramblings. I feel like I know them even though I have never uttered a word to most of them. This nice little old lady walks up to one of the recumbent spin bikes that is unoccupied and Stock Market Genius walks over and says "Hey, I am using this!" I was shocked. She moved on - without a peep. I really really really wanted to say something. I rose above it and used the fury on the bike. Understand this ... during the exchange Stock Market Genius (SMG) was standing in front of Grumpy Old Marine (GOM) who was daintily pedaling his spin bike and they were trading political barbs ... even though I believe they are on the same side. Flappy and Bragtastic were on two other recumbent spinners and were also interjecting their opinions into the conversation. So as not to be drown out by the buzz of the treadmills and stairmasters they made certain their opinions were heard. Even though I did not speak up and help the lady out I do feel as though at least one of the other gentlemen should have told SMG to allow her to have the bike while he continued his circular politico conversation. One would tend to believe that GOM would be the one to correct the situation but perhaps I am overgeneralizing the Marine Corp populous. Bryonman - what the hell are you rambling about? What is the point? 1) If you are at the gym please workout. At least fake it. If you are not there to workout - cancel the membership and start a meetup group that sits at a coffee shop to discuss whatever you want to discuss. 2) Do not bully others while hiding behind a mob mentality - especially those who are genuinely there to workout. It is shameful to see adults behaving like middle-schoolers. 1) Don't hover and/or linger in the locker room. It's weird. 2) If you ARE using the locker room as a "hangout" ... let's not take "hangout" so literal. Cover it up. That's for you Flappy and Wrinkles. 3) The hand dryer is not a body drier. Stop it. If I have offended you ... you might consider your own use of the gym. Fall cleaning at the house. On October 27th Carrie, Baron and I went on a 20 mile - 26 hour backpacking excursion to Reavis Ranch in the Superstition Mountains. The hiking was rocky and had a bit of climbing ... but we were basically alone for most of the walk. Bonus track: The famed apple orchard produced tons of apples this year. These trees are over a hundred years old and have not received ANY maintenance in years ... yet they still produce apples. These are real apples. Tasty ... and surprisingly small compared to the modified giants we see at the grocery store. This past weekend we went on a 10 mile hike on Trail 100. It's still flipping hot on the desert floor. It was 92 degrees when we finished hiking on Saturday morning. Yesterday we did some straightening and cleaning around the house. I did a run/bike brick workout for speed. It's been a while since I have done a true speed workout and I could tell. We also donated some clothing and knick knacks to the local Goodwill. It feels good to give away USABLE items. Sadly, I see people taking JUNK to Goodwill. I am torn on this. On one side I see that it might be better than being in the landfill. On the other side I feel like this stuff will eventually END UP in the landfill anyway. Get out and vote ... but no matter which way you vote - don't be rude to people just because they don't vote like you. Remember - it is the lesser of two politicians ... where politicans = mostly corrupt. I wish we voted on LEADERS and leadership rather than parties, special intrest or politics.